1-2 Tablespoons of freshly ground unsweetened peanut butter, if you can’t get freshly ground organic peanut butter, use the freshest kind you can find. This is one of the easiest and quickest recipes you will ever find me posting. I learned this recipe from my brother Paul Barchilon. It takes ten minutes to put together and about forty minutes to bake. Pre-heat the oven to 350° then heat the coconut milk, curry paste and peanut butter in a saucepan. I whisk them all together to help make sure there aren’t clumps of peanut butter or curry paste. Slice the tofu block into three equal slabs, then slice the slabs in half lengthwise, and then in half horizontally. Cut the remaining parts into long triangles so that you end up with a bunch of wedges. You can also just chop the tofu up into medium chunks, but it’s a lot prettier if you make the tofu into the triangles. 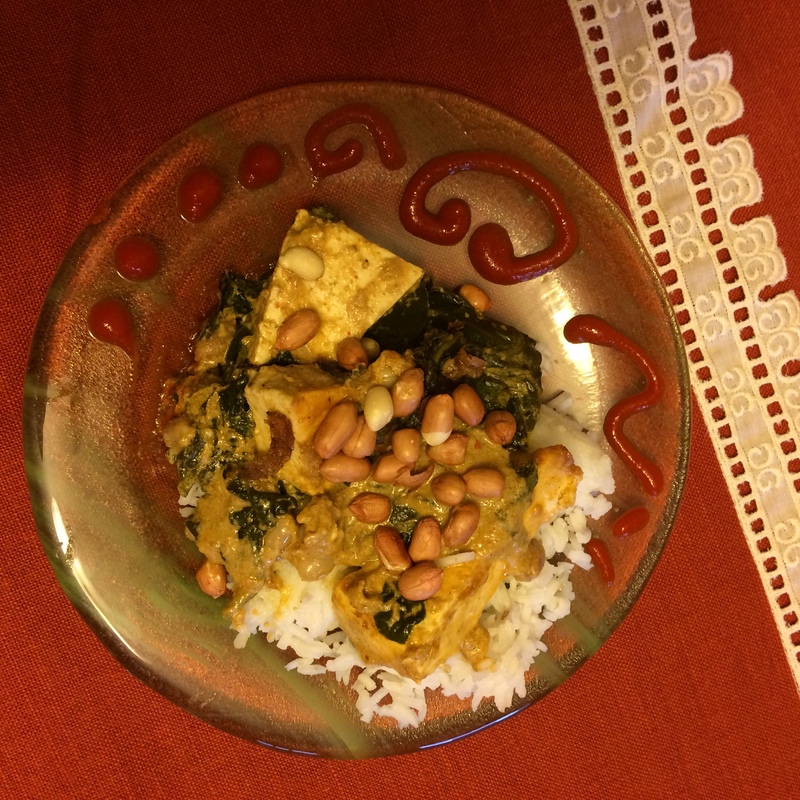 Put the tofu and spinach into a large bowl along with half of the peanuts. Pour the heated coconut milk mixture into the bowl. Stir gently with large spoon to coat spinach and tofu, not a rigorous stirring. Empty into a large Pyrex or other casserole dish and cover with parchment paper or tinfoil, place in the oven and set your timer for 40 minutes. While the casserole is cooking prepare rice to go with it. Garnish with hot-sauce and the rest of the peanuts on top. Voila, dinner super quick and easy! Variations on this are welcome. If you want to make this recipe with chicken, I suggest cutting up the chicken into smallish pieces because you don’t want to cook this dish for too long, or you can sauté the chicken up first before baking it. If you don’t want to use a ready-made curry paste, just make your own version and add it to the coconut milk. Yummy! Can’t wait to try it.